Pete Hogan is a well-known visual artist, who specialises in paintings of Cityscape and Seascape. Born in Dublin, Ireland and educated in both Dublin and Vancouver, Canada he has traveled extensively. He now divides his time between Dublin and Sydney Australia. He is married to Micaela and they have two children, Clara and Joshua. Pete Hogan's early work was in sculpture. This led him to an interest in drawing and thus to painting. He also makes prints, chiefly etchings and is a member of the Graphic Studio print workshop, Dublin. Early influences on Pete's work were the carvings of Henry Moore, the graphic style of Edwardo Paolozzi and the panache of Christo. More recently he tries to develop his own style in the broad context of modernism and Irish Art. Pete Hogan specialises in the painting of buildings and streets and more recently in the people who inhabit them. He also paints boats and seascapes. He has sailed around the world by way of Cape Horn in a boat which he built himself. A feat which he describes in the book he wrote and illustrated - Log of the Molly B. He has also Written The Artist on the Island, about Achill in the west of Ireland and illustrated the children's best selling book Titanic about the famous shipwreck. Pete Hogan has exhibited with many groups and galleries over the years. His work is contained in several public collections, corporate collections and in countless private collections all over the world. His work has been incorporated into his books, "The Log of the Molly B" and "The Artist on the Island an Achill Journal"
Graduated Dublin University. Traveled extensively working on fishing boats and yachts. Worked and exhibited with The Ne Chi Zu Guild in Vancouver, Canada. Built 30' ketch, "Molly B" and sailed her from Vancouver to Dublin through Panama Canal. 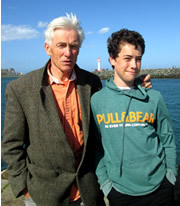 Lived in Achill, West of Ireland for a year. Exhibited extensively in Ireland including RHA, Irish Boat Shows and Peoples Art Exhibitions. Opened Pete Hogan Gallery in Molesworth St and Temple Bar Dublin. Sailed his ketch 'Molly B' around the world by way of Cape Horn. Met Micaela in Sydney, Australia. They have two children Clara and Joshua. Divides his time between Dublin and Sydney. Increasingly concentrates on oil painting and child minding. 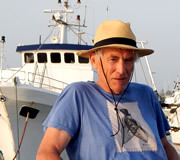 In 2012 he published his book "The Log of the Molly B" about his sailing adventures. In 2013 "The Artist on the Island an Achill Journal" was published. Both books are full of Pete's beautiful illustrations.